My new All-Clad stainless steel cookware set is by far the best cookware I've ever owned, bar none. It cooks evenly and cleans up easily, and the 14-piece set includes pretty near all the pots and pans I'll ever need. Two frying pans (one of them is gigantic! ), two saute pans (one of them is gigantic! ), two sauce pans, a stock pot, and a chef's pan. Plus lids. I've always made do with inexpensive cookware from Wal-Mart or Target, but now that I've used my All-Clad stainless, I'll never go back to that cheap stuff. It almost makes cooking fun. I particularly like the large chef's pan. It's great for so many uses, and it's large enough to hold plenty of food. I had never even used a chef's pan before, but now it's one of my most-used pieces. The high-quality stainless steel ensures even cooking, and is perfect for my induction cooktop. All-Clad incorporates a three-ply bonded design: an aluminum center core clad in stainless inner and outer layers. This produces very good heat distribution, with the durability and safety of stainless on the outside. This is the kind of cookware that will last forever and can be passed along for generations. As soon as I can afford it, I'll probably get a set for my daughter, and years from now, my set can go to a grandchild. I don't want my daughter to have to wait until I die to have her own set of All-Clad. Yes, this cookware is that good. 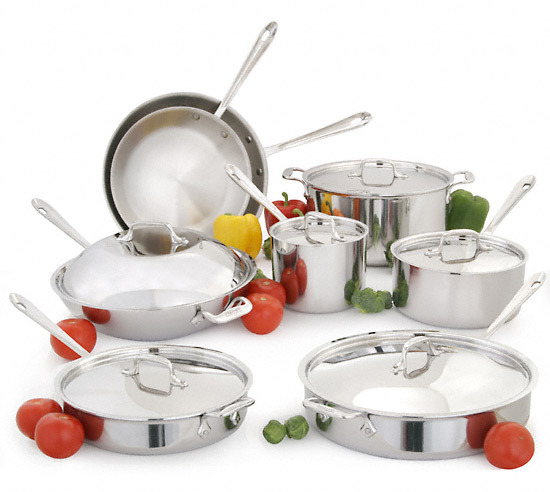 The 14-piece All-Clad stainless steel cookware set is available from Amazon. You can often find excellent bargains on eBay for All-Clad stainless cookware sets.